On football Saturday's in Ann Arbor, some 110,000 people make their way into Michigan Stadium. 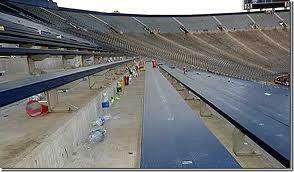 When the cheers have faded and the crowd gone home, the big job of cleaning up the 'Big House' begins. This week, we take a look at how U-M deals with the big mess. This week's Issues of the Environment from WEMU examines Washtenaw Community College's efforts to reduce, recycle, and now, compost. Our guest is WCC's Facilities Maintenance Manager, Barry Wilkens.